Road Movies is the debut CD from the Los Angeles-by-way-of-England quartet Minibar. With production by T-Bone Burnett (who recently topped the charts as the producer of the Oh Brother, Where Art Thou? soundtrack), the 11 tracks are representative of sad-eyed electric country. 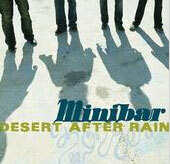 Minibar consists of Simon Petty on lead vocals and acoustic guitar, Sid Jordan on bass and piano, Tim Walker on electric and pedal steel guitar, and Malcolm Cross on percussion and keyboards. The band moved from London to Los Angeles two years ago when it found that the Southern California environs more suited its blend of distilled electric country. Minibar moved to Los Angeles in July 1999, after a brief visit made it clear that Southern California was where they belonged. Says Sid Jordan, "We never really thought about it much in England, but it just suddenly hit us to go to the home of the music we love." Continues lead singer Simon Petty, "The English are known for a short, punchy pop structure. We listen to a lot of American music, that's where the flavor comes from, but the songs are still quite English . . . Harmonies are the key thing we love in the band. The three-part harmony thing is very West Coast, which is really our musical homeland." Producer T-Bone Burnett is a steadying influence, with songs like "Lost in The Details" and "Cool Water," living up to a long heritage beginning with Gram Parsons and continuing through Wilco. Also included is "Choked Up," a cover of a Whiskeytown song. Explains Simon Petty, "It was the tail end of Britpop, and we were playing three-part-harmony pedal steel guitar songs. It was very unfashionable at the time, although it's probably quite fashionable now. Everybody seems to have a pedal steel guitar player now." For a British interpretation of country rock, try Road Movies.